The model Settings command of the Tools menu will open the Model Settings dialog. In this dialog you can change some general settings such as the size of the reference frames or the amount of gravity. • Gravity: You can set the gravitational acceleration to any desired value. • Hard Coded: choose this option if you want to optimize for speed. • As Parameter: Use a gravity parameter, allowing you to change the value before the start of a simulation run. • As Input Signal: get the gravity value from an input signal, allowing you to change the value during simulation. • Spring Dampers for Constraint Joints: Choose this option if you want to use spring dampers for closed kinematic chains. 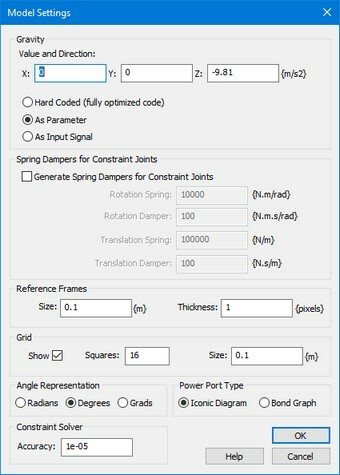 You can override the spring damper values for individual joints if required. • Rotation Spring: Set the desired stiffness for the rotational spring. • Rotation Damper: Set the desired rotational damping. • Rotation Spring: Set the desired stiffness for the translation spring. • Translation Damper: Set the desired translation damping. • Reference Frames: Choose the size and thickness of the reference frames. • Grid: Set the grid. • Angle Representation: 20-sim uses SI-units for the model equations (e.g. radians). You can choose to show them in non-SI-units like degrees or grads. • Power Port Type: Choose Iconic Diagram power ports or bond Graph power ports. • Constraint Solver: set the accuracy of the constraint solver.